Why you are running a Shamrock race in 2014? I usually only do a couple of races a year because of time, money and childcare… and I’m not a morning person! I prefer to run 3-5 miles, but it’s great to have a bigger challenge and goal to work towards. 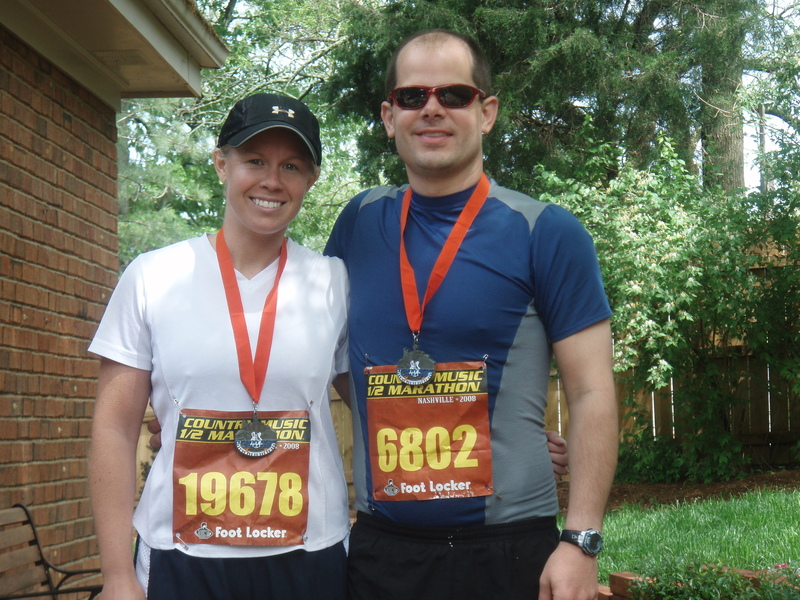 I ran the Shamrock half-marathon in 2013 and thought it was a great race… very organized and a fun course. I knew I wanted to do an event with Team LIVESTRONG again so this year I created a “LIVESTRONG for TR” team and signed up for the half! When did you start running? I started running during college to stay in shape… although I took some time off with both kids. How many races have you done and what’s your favorite? This will be my 4th half-marathon, I’ve done a couple 10k’s, and a couple 5k’s. My favorite is probably my 1st half marathon… Country Music 1/2 marathon in April of 2007. TR decided to host a fundraiser dinner for LIVESTRONG the night before the race so I signed up and didn’t really train all that well. It wasn’t my best race, but I teared up at the start seeing all the people running and cheering, I loved all the music and bands along the course, and then I couldn’t believe I actually completed it… 30 minutes after TR. Where do you prefer to run? I tend to run around my neighborhood because it’s convenient and I can get to a full 13 miles pretty easily without much repetition. I’ve started to enjoy running with others as well and a friend introduced me to this great group called “Mom’s Run This Town” (MRTT) so I’ll meet people anywhere! It’s also pretty fun to run around lakes when I visit my family in MN! What’s the longest distance you’ve run? 13.1 miles… and I don’t really have a desire to run anything longer! What is the one thing you DON’T like about running? I’m kind of a slow runner and sometimes it feels like it takes forever to get from point A to point B… and I swear on windy days it feels like I’m always running into the wind! Favorite post-run indulgence? My diet often resembles that of a fraternity guy… too much pizza, pasta, sweets and beer so I indulge a little extra after a good run… especially ice cream! Favorite running shoe? One that fits… since models seem to change every year, I’ve also changed. I’ve been happy with Asics, Saucony, Nike and New Balance. Favorite song to run to? Lately it’s been Calvin Harris featuring Ne-Yo, “Let’s Go”… I prefer anything with a fast beat to keep me going though. Favorite website to waste time on? Probably Eonline or People.com… definitely a “waste” of time! Favorite running moment? My first and only race I ran side by side with TR was back in 2005, the Cooper River Bridge Run in Charleston, SC. It was a 10k over this old bridge before they tore it down. We paused for a pic as we started over the bridge and I just kind of looked around… I couldn’t believe the sea of people in front and behind us (I think like 42,000 had signed up)… it was pretty cool to be a part of that historic race. If you could pick one celebrity to run with, who would it be? Reese Witherspoon… although I probably couldn’t keep up since I always see pics of her running. 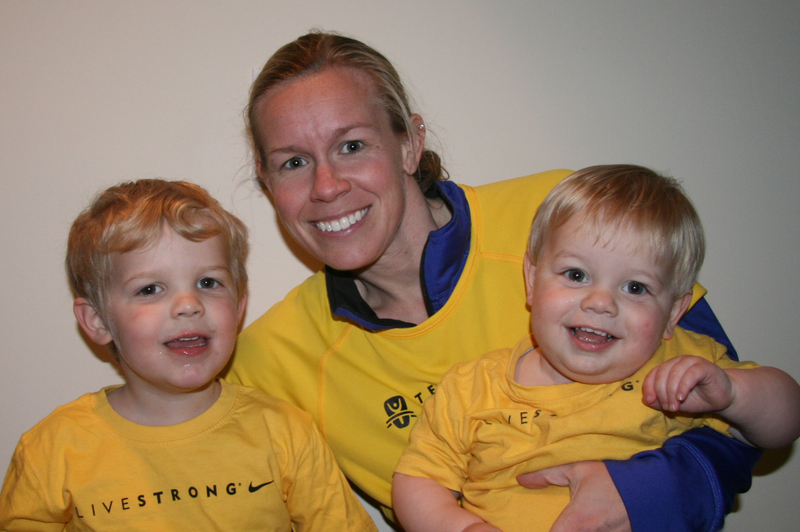 If you’d like to help Jen raise money for Livestrong, you can visit her fundraising page here. Wow truly an inspiration. I am so sorry for your loss but you are truly an inspiration. You continue to amaze me. You’re boys will some day know and understand how wonderful their mommy is.